Finally back to Singapore after a long vacation. Nothing is in place at home as usual and I was confused where to start settling things. Luckily the school reopens only after a week and I have some breathing space in that area. With my husband’s taste buds waiting for some good food, I decided to prepare a fusion baked appetizer of Potato and Spaghetti rolls mixed in powdered rosemary-garlic croutons. As mentioned in my earlier post of Baked Masala Vada, any cooking in the oven needs very less oil and less attention in the kitchen and indirectly saves our health and time. Here goes the recipe of “Baked Potato Spaghetti rolls” along with my experience & review of Shopback online store. During my hectic times I generally prefer to purchase online as I could save my time to drive to Little India where 75% of my shopping happens for kitchen. Around a month back, ShopBack invited me to try out and review their services and write about my experience with them. One of the online stores they have on board is RedMart, which I chose. I must admit it was just cool as I was able to get all my items (Indian, Italian groceries) at one single place. The online experience was very user friendly and items where clearly classified. The payment gateway was completely secured similar to any proper online store where by I received an OTP to secure the payment. ShopBack have a list of merchants and they provide cashback to shoppers who shop at those website via ShopBack. To name a few for food (which you can view the complete list here) they have RedMart & Foodpanda. Items which are available after 2-3 days where mentioned clearly while shopping and it allowed me to decide better. I was allowed to choose the delivery date and time. The delivery was prompt and there was an SMS which informed me before the delivery person came. Above all I got a cash back of 10% of my total bill which got credited to my shopback account. You can also save more on top of your cashback when you look for the latest coupons here. Truly a very convenient and satisfied experience for me and I am already preparing my second set of grocery list. 1. Cook spaghetti as per the instructions given in the packet and cool it. 3. Powder the croutons in a mixie. 4. Blend coriander leaves, ginger,green chili. 6. Add potato, spaghetti, croutons, coriander leaves mix, salt into a single container. 7. Add few drops of lemon. 8. Mix and mash all of them. 9. Take a small portion and make them into oval shaped balls. 10. Keep the rolls in refrigerator for a min of 20 mins. 11. Take an oven tray and cover with aluminum foil and brush oil. Covering with aluminum foil is optional. 12. Take the potato-spaghetti rolls and place them in the tray. Brush oil on the rolls. Brushing on top side is enough. 13. Pre heat oven for 5 mins at 180 deg. 14. Place the tray in the oven and keep checking in between 15 mins. 16. Flip the pieces once the bottom side is cooked. Generally the bottom side gets cooked first and it again depends on how you set the oven. When you flip you may brush with oil if you required but this is purely optional. 17. Once all the sides are cooked you may switch off the oven and remove these potato rolls for serving. Potato Spaghetti Rolls is ready to be served hot . 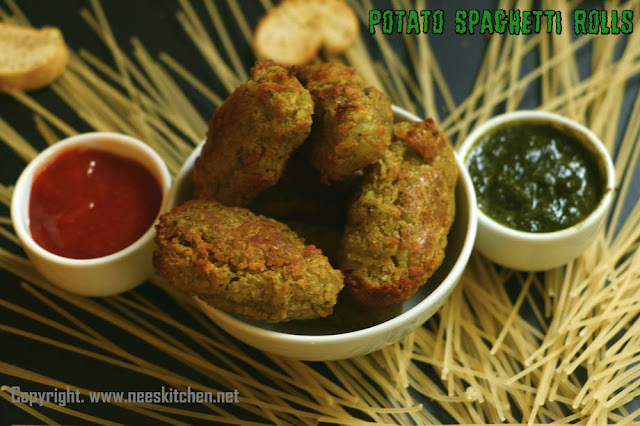 You may serve it with mint-coriander chutney or tomato ketchup. If you do not get croutons you may use bread crumbs, in that case you must add garlic and some herbs of your choice. A pizza topper is a right choice in that case. Spaghetti and potato must be in equal quantity. Changing the proportions may alter the taste. Adjust the quantity of chili's the one which I have mentioned is of medium spice. The review of shopback is based my personal opinion and experience.